Explore new worlds with the LG 360 VR Smartphone Headset. This headset can be connected to your LG G5 smartphone via a dedicated cable in order to simulate a 130" television from a distance of 6.6'. It can deliver 360° images and videos captured by the LG 360 CAM as well as Google Cardboard content via dedicated displays with a 639ppi pixel density. The headset is foldable for transport and weighs 4.16 oz. 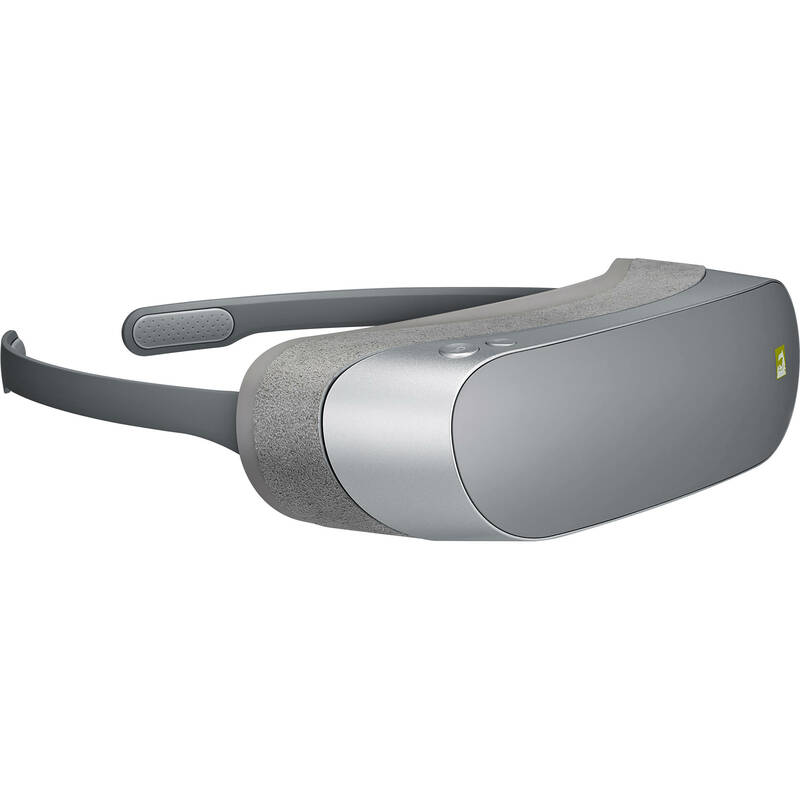 Box Dimensions (LxWxH) 7.8 x 5.3 x 2.8"
360 VR Smartphone Headset is rated 2.4 out of 5 by 10. Rated 1 out of 5 by Clinton W. from This is about as bad as it gets I bought this in a bundle with the LG G5 and it is absolutely not worth the cost of shipping, even if it were free. There is basically no app support - no google cardboard support, and I don't see how this will be updated in future. There are a small handful of LG provided apps, but they are generally not worth your time. Then there's the quality of the image - I have a $25 viewmastercardboard device which is much better with my G5 than this - I am not sure who at LG cooked this idea up, but it's really not worth your time - this I can promise. Rated 1 out of 5 by Fonso from Hurts mt eyes I was really excited to get my VR seams like a waited forever. Sadly I cant seam to use it for very long without a headace. From what I can tell the interface gui is sharp and clear.. but anytime you use any of the aps or view video's it gets soft and blurry. Also doesn't always connect to my phone without a little coaxing. will be sending this back even though I have the 360 camera. not quite there yet. Rated 5 out of 5 by Metehan from great win major win. look at this vr. its very lightweight... the main problem of VR headsets is that, you can't take them to school,work and parties or other places. they are too big... but lg vr is very light and small. yes it doesn't fully make things go completely dark due to nature of its compact design, yet this is a beast. and i don't recommend any one to use any vr headset more than 20 minutes. vr is great but a screen very close to our eyes, we don't know its capabilities of the potential damage. so better listen to instructions and don't use them over 20 minutes. about the vr 360 content: 2017 will be the year of virtual reality. and if you take this to your office and work place, people will be amazed because no one has a vr its very rare and everyone uses an iphone they dont have vr yet. so it will be a good entertainer in the school and workplace. also it may be a fun device to use at parties. Rated 1 out of 5 by Anonymous from Bad I could not even use this product because the ergonomics are so bad that it doens't fit my face, it does not seal and I can see the room I am in and it is really uncomfortable. The rubber edge should be bigger or interchangeable to fit any tipe of face. Rated 2 out of 5 by Tristan from I'm very happy it came included This was a free item with the purchase of the G5. And it's very understandable why. The only upside is that it's lightweight. It has all other downsides that make the 3-D experience very lackluster. I cannot recommend anyone purchase this. Rated 5 out of 5 by Alex wants the $1000 from Smart headset! It doesn't have x-ray vision, but, besides that, it's great! does it work with lg g5 from sprint ? This should have no problem working with your LG G5 from Sprint. The headset itself does not have a SD card slot. The card would have to be in a LG G5 phone for this headset to view the content. When will the LG VR go on display? My payment just processed from my preorder, when will my device ship? Does this work with the Lumia 950 XL? since it has the USB-C type. No, it only works with the LG G5. It could theoretically work with other phones with USB type C ports in the future...but LG probably won't allow it. All of the LG G5 Friends modules (including the LG 360 CAM, Hi-Fi audio enhancer, CAM Plus grip with 30% more battery life, and the Rolling Bot for home security) are all incentives for people to buy the LG G5. Just get a $15 Google Cardboard headset from Google if you want to try out Virtual Reality. Will it work with other lg phones? Does it work with non 360 video/photos? Will this work with PC?